What are 7 reasons to change churches? People leaving church. It is often painful for the church and for the people involved. 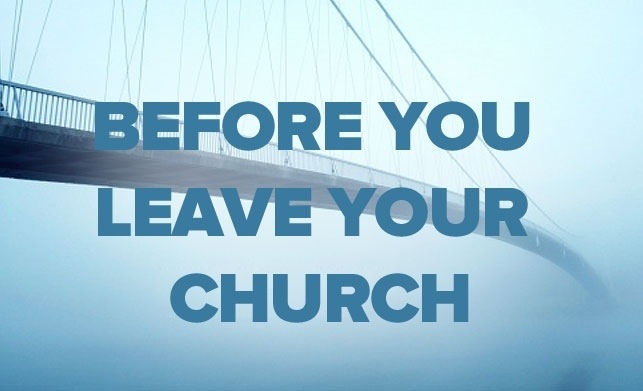 Most know that I rarely advocate leaving a church. I think that most of the reasons people leave short circuit the process of spiritual growth. If we leave based on our preferences for style, we may be limiting what God wants to do in shaping us. A servant’s heart is never shaped by getting what it wants. And if we leave because of conflict, big or small, we cut the heart out of the gospel which is a message of reconciliation and peace. 1. Lack of Submission to Scripture. There are times when a church leaves the teaching of Scripture. I’m not talking about personal interpretations. There will always be different opinions about how we see certain things (like our views of end time events). But when a church no longer makes decisions based on good theology and Scriptural authority, it ceases being a church that God can use to speak into your life. 2. Christless worship. Worship can quickly become man-centered. This can happen in churches that are meditative, or celebratory. It isn’t about style, it’s about who is the focus of worship. Has worship become just an encounter with other people or is it an encounter with the living Christ? Is there prayer in the worship? Is the Word central? 3. Disregard for one another. One of the hallmarks of Christians is supposed to be our love for one another. I think a church must have avenues through which people are connected with one another and actively care. Are people encouraged to be part of other’s lives? Are people engaging in life together? When someone is hurting, does the church respond? 4. No compassion for the lost. If a church isn’t open to the lost, it no longer reflects the heart of God. If a church doesn’t pray for, care for, or involve itself in the needs of the community, it is no longer on mission. 5. Entrenched leadership. When a church no longer raises up new leaders, or is even open to new leaders who come their way, it demonstrates resistance to change. If a church is not open to change, a church can’t listen to or respond to God’s leadership. Change is a constant in our world. It is also a constant in our walk with God. He wants us to be transformed. If a church has the same group of leaders it had 20 years ago, it may be expressing a closed mind to new ways God wants to work. These first five reasons reflect situations that can be changed. Churches go through seasons of ups and downs. And it may be that you are being called to bring change and health. So, before you go, ask, “Does God want me to help things realign with God’s Word and God’s heart?” But for a church that has developed these patterns, change, if it comes will probably come slow and painfully. These last two reasons are really positive reasons to leave. It isn’t because you want to disconnect yourself from a church, but you want to involve yourself more closely with THE church. 6. Distance. Sometimes you are ready to take the next step of involvement and you’ve chosen a church that is just too far away to make that possible. When you have kids, or experience job changes, distance and involvement are directly related. There may be a time when you need to connect with a church that is closer to home so you can connect more. 7. Building the kingdom somewhere else. It may happen that you have passions, gifts or talents that God wants you to use for ministry and to be effective God may be calling you somewhere else. This is what can happen to pastors when they sense God calling them to bring leadership to another part of His work. God has the right to redirect His resources to places it will be more effective. These reasons are rare. And we should evaluate all our reasons for change. We need to be in prayer and seek godly counsel when we’re considering a change like this. And we must be cautious not to make a decision that will get in the way of our own spiritual growth. Maybe you can give some ideas about how best to leave a church when you determine it’s the best thing for you and the church. I would like to hear about your church leaving experiences. Why did you leave? Was it the best thing to do?